Horseback Riding Helmets Are A Must! 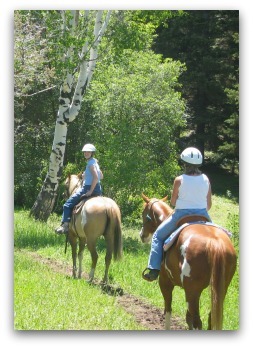 Horseback riding helmets are the most important but UNDER-used piece of essential gear for riders. Yes, I said UNDER-used. A helmet that was never bought or one that is hanging in the tack-locker, or worse is attached to your saddle while you are out riding simply can’t save your life. They think they are a skilled enough and don’t need one. This is such a myth. Skill has nothing to do with whether you are going to sustain a head injury while riding a horse. Horses are unpredictable, large animals. Even the well-trained ones can still trip or do something out of the ordinary. and you can't control the terrain. If your horse falls, you fall. And your head could hit the only rock around whether you are in an arena or on the trail. Are you willing to bet your life on that every time you ride? Yes, your LIFE as you know it is at stake when the issue of wearing horse riding helmets comes up. How Do Helmets Work and What Kind Do I Need? The look fairly similar to a bike helmet. While I often see beginning horse riders taking lessons with a biking helmet this is not recommended. 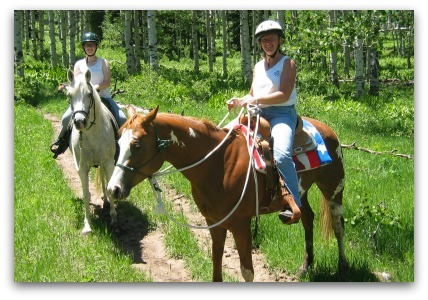 Horseback riders are often further from the ground and can be going at even faster speeds than a biker. Horse riding helmets are designed to look like a traditional english hunt cap or riding hat. Some have even been styled to look like a western cowboy hat. You should only buy a horseback riding helmet that is ASTM/SEI certified. 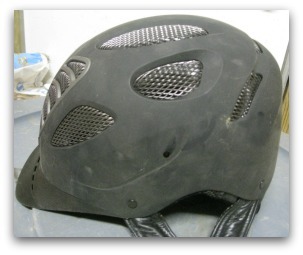 The testing required for the ASTM/SEI certification verifies that the helmet provides adequate protection for horseback riding. Helmets always have a harness that fastens under the chin to keep it securely on your head in case of a fall or impact. The good news is that a typical schooling helmet doesn’t cost much more than a biking helmet would. Your noggin is worth the investment! A helmet that has been involved in an impact should be replaced immediately. There are many different manufacturer’s of horseback riding helmets and each one will have a slightly different fit and padding system. This makes it possible for you to find a helmet that is very comfortable for your head. Some have ways to adjust the fit once it is on your head making your helmet feel almost custom. Feel snug, but not too tight. If it is too tight it will give you a headache. And that is no fun to ride with! If you can't see where you are going if you move your head around because the visor is in your eyes, you helmet is too big. If the helmet is fastened too loosely, it can be dangerous in a fall. Too tight and it can restrict your air! My first helmet was heavy, hot and very cumbersome. Thankfully, helmet technology has come a long way! Helmets are now so lightweight you will barely remember you are wearing one! They can also be very low profile so you don’t feel like you are wearing a big bubble on your head! and other horse riding gear and things have definitely vastly improved for helmets whether you pleasure ride or are a serious equine competitor. Helmets are generally required in any class that requires jumping. 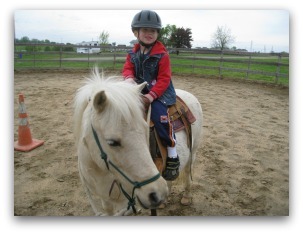 Many shows require junior riders to wear them anytime they are mounted. Some states such as Florida and New York have made laws requiring helmet use for all junior riders state-wide. It is also possible that your local barn will require horseback riding helmets for all riders due to liability insurance policies. After you turn 18 your head isn’t going to magically get hard enough that you don’t need to protect it with a helmet! Wearing a helmet can help keep you in the saddle for years to come.